If the past is any guide, it is almost certain that Facebook’s February 1 filing of an IPO, which could value the company at as much as $100 billion, will generate major attention online. In the realm of social media, Facebook is a major and enduring topic. 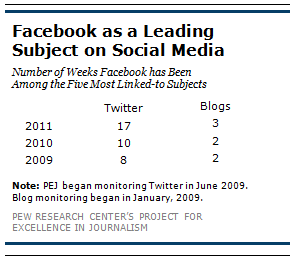 Since PEJ began tracking the conversation on blogs in January 2009 and Twitter in June 2009, Facebook has been among the top five topics on one of those platforms in 39 different weeks. And that interest seems to have grown over the past year. In 2011, Facebook was among the most popular subjects on either blogs or Twitter 18 weeks compared to eleven weeks in 2010 and 10 weeks in 2009. These are some findings of a special edition of the New Media Index from the Pew Research Center’s Project for Excellence in Journalism, which examined how often and over what issues Facebook has risen to the top of the conversation. Overall, it has been users of the competing social network, Twitter, far more than bloggers that have shown a strong interest in news about Facebook. During the past two and a half years, Facebook made the top story list on Twitter in 35 weeks, compared to seven weeks on blogs (there were three occasions when Facebook was on the list of both platforms). Some of that discrepancy may be tied in part to the more tech-centric nature of Twitter and because Twitter, more than blogs, is often a vehicle for simply passing along new information. Looking across the 39 weeks of attention, two prevalent themes emerge: changes to Facebook’s interface and technology, and the business aspects of the growing enterprise. The reaction to network developments depended in large part on the issue at hand. Privacy related issues tended to spark the greatest concern while new functions and technology generated a more positive response. Facebook may well continue to wrestle with issues of privacy since, as many analysts have suggested, the personal data of the site’s 800 million users is a large part of what is being leveraged during the IPO. In May 2010, Facebook CEO Mark Zuckerberg published an opinion column in the Washington Post in response to an outpouring of resistance to the site’s changes to privacy settings. Consumers were concerned that Facebook could sell information to third-party companies and that Facebook’s polices were purposely complicated. More than a year earlier, in February 2009, bloggers were outraged when a consumer advocacy blog noticed wording changes in Facebook’s terms of service. Last February, twitterers took notice when two media artists imported 250,000 publicly available Facebook profiles to a dating site without permission to demonstrate potential dangers of identity theft. Alterations to the site’s interface and functions were also generally met with resistance. This was especially true in September 2011 when Facebook revamped its layout and key functions by overhauling user profiles and adding a timeline function. Many users objected to the new live activity feed called the “ticker” which highlighted information the site thought users would enjoy. “FB knows what’s important to me? Obviously not!” tweeted Joyce Barrass. “Gimme back ‘most recent’ layout, new FB no good!” demanded @karenevans01. When change meant improved capabilities, though, social media users often cheered. In September 2009, Twitter users heavily shared the news that Facebook was creating a voice chat function and “status tagging,” a way to identify and link to other people in their status updates. The combination of the “like” and “share” commands into a single “like” button drew more interest on Twitter than any other subject the last week of February 2011. And in August 2011, bloggers praised the introduction of Facebook’s new mobile Messenger app. The business aspects of Facebook were also of great interest on social media. Last November, when reports first surfaced that Facebook was considering a public offering, it was the second most linked-to subject on Twitter that week. “Facebook Inc. is inching closer to an initial public offering that it hopes will value the company at more than $100 billion, according to people familiar with the matter,” reported a Wall Street Journal article that was widely linked to at the time. Six months earlier, Twitter users focused on a report that Facebook was partnering with media companies for a new feature that would integrate video and music into users’ profiles so that the site could one day become a “central hub” for multimedia online. Even an advice column on how to land a job working for Facebook drew attention last April. And the personal wealth of Zuckerberg earned focus when he signed onto the “giving pledge” created by Bill Gates and Warren Buffett to donate most of his wealth to charity in December 2010. On multiple occasions, reports about potential negative Facebook impacts on teens drew attention. In August 2011, many tweets highlighted a study conducted by a professor of psychology at California State University that suggested overdosing on Facebook may lead to the development of psychological disorders in teens. And in February 2010, a report about a Wisconsin teenager convicted of using the social networking site to blackmail classmates was the third most popular subject on Twitter one week. The fascination with Facebook also brought social media users to Hollywood. A rumor in September 2009 that a movie was going to be made about the founders of Facebook was the third-biggest topic one week on Twitter. That movie, released about a year later with the name “The Social Network” made more than $200 million worldwide and was nominated for eight Academy Awards, winning three. Last week, the leading subjects on blogs involved topics regarding other aspects of the web such as search technology and privacy. For the fourth straight week, the subject of Search Engine Optimization, otherwise known as SEO, was among th e most popular topics. Bloggers shared posts with recommendations on how to increase traffic to one’s site. Many also pointed, however, to a post on Search Engine Watch that warned of how lobbying groups have learned techniques to influence results on search engines to promote specific issues. A blog post by Jorgen Sundberg-a world renowned social media trainer with connections to the popular social media sites LinkedIn and Link Humans-about how he plans to change his blogging strategies for the coming year was the No. 2 subject. A post on Google’s blog about changes to the company’s privacy policies and Terms of Service was third. Some commentators and politicians feared that the company would be storing more consumer information and could not be trusted. 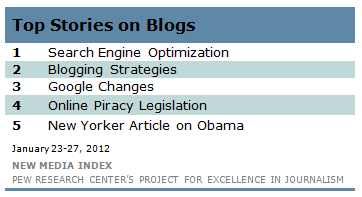 A related controversy over online piracy legislation-which drew online protests the previous week-was the fourth-largest subject and bloggers continued to follow the specific members of Congress who have come out against the unpopular SOPA and PIPA bills. A similar subject was the No. 1 video on YouTube last week (see below). And an article in the New Yorker based on hundreds of internal White House memos from Obama’s first months in office came in at No. 5. The story served as a rare glimpse inside the decision-making process of the president during his efforts to promote a stimulus package and health care reform. Pop culture references and a freedom of speech issue involving Twitter itself led the conversation on Twitter last week. The Korean boy band Super Junior was the No. 1 story, making it the fifth time in the last six weeks where the group ranked among the most linked-to subjects on Twitter. For the second week in a row, viral tweets from the feed @The90sLife showing pop culture references and characters from the 1990s were popular, finishing this time at No. 2. Twitter itself was the third subject with most of the links going to a blog post on the Twitter site announcing that the company would now have an ability to censor some content from certain countries, while leaving it available in others. For example, countries such as France and Germany have bans against pro-Nazi content. In order to prevent such content from appearing in those countries, Twitter used to have to remove the content altogether. Now, however, it can remove that content from certain countries without removing it from the site completely. Twitter argued that this change is good for freedom of expression because it allows opinions-even those that are unpopular-to appear in more places than before. Links to a live stream of the January 26 Official Hand and Footprint Ceremony for Michael Jackson at the Grauman’s Chinese Theater in Hollywood were the fourth most popular subject. 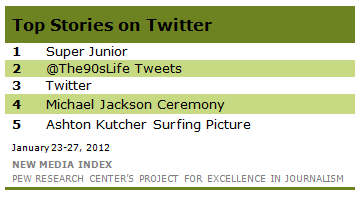 And a picture tweeted by actor Ashton Kutcher of him surfing in the streets of Sao Paulo, Brazil, during a heavy rain storm was the fifth most-tweeted subject. The debate over online piracy, which was the top subject on both Twitter and blogs one week earlier, moved to YouTube last week as it registered among the most watched news videos. The No. 1 video was in Polish and was produced by Anonymous, a group known for promoting internet freedom by hacking public websites. The clip condemns the Anti-Counterfeiting Trade Agreement known as ACTA, a treaty signed by eight countries including the United States last October. The group argued that this agreement regarding intellectual property rights would allow online communications to be monitored and censored, and urged people to oppose it for the same reasons most opposed Congress’ Stop Online Piracy Act (SOPA) and Protect IP Act (PIPA). A similar video produced by a different advocacy group was the top video last October. The No. 4 video focused on the American piracy bills. The clip came from the HBO program Real Time with Bill Maher and showed the comedian defending SOPA and PIPA. Maher, who admitted he had not read the bills, complained about how much he lost from people illegally downloading his own movie Religulous and argued that people just want “free stuff.” His three panel guests, who represented a range of political opinions, strongly disagreed with him and voiced concerns over the unintended consequences the bills might have on an open internet.